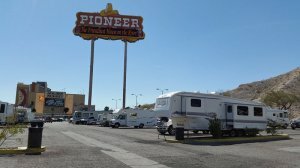 While staying at another casino in Laughlin, we checked out the overnight RV Parking here. There were about a dozen rigs in the RV parking area in front of the casino. Another nice option to spend the night at in Laughlin.